Geez, it's been a long weekend of almost incessant Galaxy Tab II teasing, but the time has come: Samsung's finally releasing the official details of its 10.1-inch, Android Honeycomb tablet to the world. 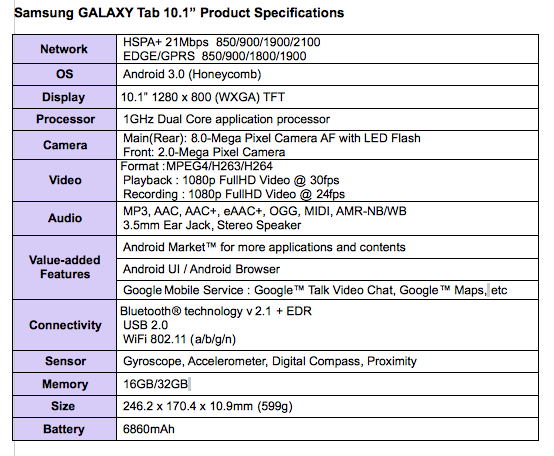 Contrary to the leaks, the tablet is called the Galaxy Tab 10.1 -- grabbing its moniker from the screen size, obviously -- and like the rest of the upcoming Android 3.0 tablets it's powered by a dual-core Tegra 2 processor, will be available with 16GB or 32GB of storage, and has a front-facing 2 megapixel camera as well as a 8 megapixel imager around back. That's just the tip of the iceberg, but we've got the nitty-gritty too -- find specs, full impressions and even some video of the slate in action after the break! Oh, and don't forget to stop by the galleries below to see the new Tab 10.1 up close and then face off with Sammy's original Tab, not to mention the Apple iPad. We may have all the spec answers, but on the launch front we're still left in the dark on quite a bit. Samsung says the 10.1 will be launching in March in both Asia and Europe -- Vodafone will be the first carrier to nab the Tab -- but it had absolutely no timing details for the US market. Price? We've got no idea, though we're told it will be "competitive." As we say in the video, the first thing we noticed about the Tab 10.1 was how light it felt in hand. Tipping the scales to just 1.23 pounds (or 599 grams), the 0.4-inch thick tablet felt noticeably trimmer than the 1.5-pound iPad and even the 1.6-pound Motorola Xoom. Sure, the Tab 10.1 is primarily made out of plastic rather than some sort of metal, but it still felt rather rigid. We're happy to report that Samsung also did away with the very smooth glossy back of the 7-inch Tab -- the 10.1's cover has a grippy, patterned surface, which actually reminds us a bit of the Streak 7's rear. Still, we'd say it's getting quite hard to tell these tablets apart from one another, on the front there's no buttons or anything indicating the slab is made by Samsung, though the chrome circular logo on the back does add a little character. Obviously, the heart and soul of the tablet is its 1280 x 800-resolution 10.1-inch TFT display, and while it's not Super AMOLED or Super AMOLED Plus quality, it looked quite bright at a variety of angles. 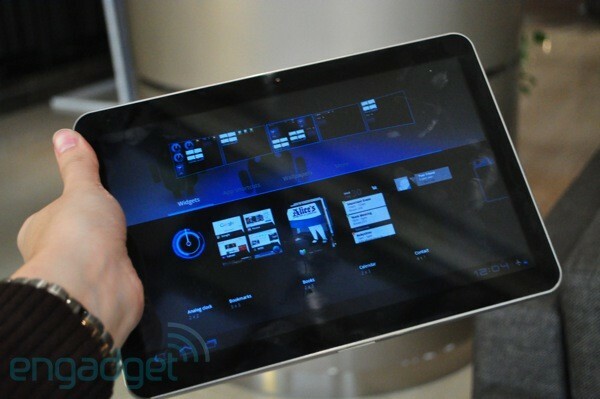 We'd venture to say that Samsung's using a similar panel as in the original Tab here, which is certainly a good thing. Surrounding the tablet you'll find a SIM slot, 3.5mm jack, and Samsung's proprietary charging cable. Sadly, there's no USB or HDMI ports. The rear 8 megapixel cam has a LED flash and can capture 1080p video, while the 2 megapixel lens centered on the top bezel should suffice for those Google Talk Video calls. The Tab 10.1 runs stock Android 3.0 or Honeycomb. Nope, no TouchWiz or custom Samsung tablet apps here, and according to Samsung it will stay that way -- it is, in their words, a "Google Experience" device. We've obviously had a few solid looks at Honeycomb in the past few months and we're excited about the improved user experience, but also the apps, which take advantage of the extra screen real estate. As for performance, the 10.1 seemed pretty snappy in our short time with it. Obviously, Tegra promises full 1080p playback, and the preloaded HD clips on the unit we saw played quite smoothly on the screen. 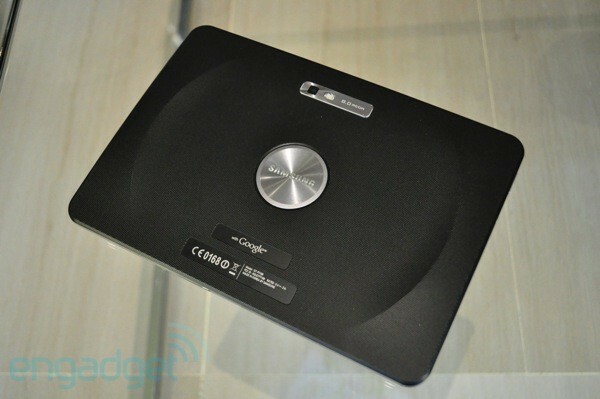 The tablet also has a both a gyroscope and accelerometer so we're expecting a pretty decent motion gaming experience. We're starting to notice a pattern with these Honeycomb tablets, and our guess is you are too. Most of them (Moto's Xoom and the Toshiba's Tablet) have 10.1-inch displays, Tegra 2 processors, dual-cameras, and run an untarnished version of Google's Honeycomb OS. Obviously, the cookie cutter specs are no coincidence -- Google's calling a lot of the shots here -- but it's making it incredibly hard for these companies to differentiate their wares. We won't really know how Samsung's Tab 10.1 stands up to the rest until we get to take a closer look at it, but there's no doubt that its lightweight design is what really sets it apart, and hey, if Samsung can undercut the rest in price (eh hem, Motorola! ), we'd say it stands a real fighting chance in the very soon-to-be-crowded tablet market. Note: Excuse where we say in the video that other Honeycomb tablets don't have USB ports -- that's not true, the Xoom has one. We were high on jet leg.